Two posts in one day! I am on a roll today! Yesterday I received the July 2012 Glossybox* that is festival themed so perfect for this time of year. The Collin Resultime Regenerating Collagen Gel can be used daily as a serum or a sleek mask and i think i will personally use this as a serum before i apply my moisturiser. This is a generous 15ml sample and a full size 50ml tub retails for a whopping £47.25(!) making this sample worth around £14. I have received a Awapuhi Wild Ginger product in one of my Glossyboxes before but i dont think it was the texturizing sea spray. I have never used a sea spray although i have friends that swear by them! This is a surf inspired spray that adds texture to create a tousled, beachy style. Perfect for spritzing on your hair after swimming on holiday! This is a generous 25ml product - perfect for travel and the Full size 150ml bottle retails for £18.95 making this worth around £3. Monu is another brand that has been featured in beauty boxes many times. This time i received a small sample size of the Calming Cream that is a green tinted cream that works by neutralising the redness often noticed on the cheeks and chin area. This is a 20ml sized sample and 15ml is actually full sized so this is even bigger than that. 15ml retails for £14.95 making this worth around £20. The next product in the box is the Jelly Pong Pong Cosmetics Lip Frosting. I have actually reviewed this product before here. This is in the shade Irish Cream Pavlova that smells amazing and can be used either on the lips or cheeks. This isa full size 15ml product and retails for £10. I have heard so much about Kryolan products before so was excited to see this nestled inside my box. This is the Kryolan Satin Powder Sparkling eye dust that believe me is extremely sparkly! It is a gorgeous peach shade that i think would look just as amazing doubled up as a blush. Again another full size 3g product that retails for £4.75. Each box also came with a bonus product in the form of the Elizabeth Arden exfoliating cleanser, optimizing skin serum and skin balancing lotion samples which is a nice little extra. Overall the samples in this box are worth just over £50 which is pretty amazing for a both that costs £10 per month. It also features 3 full size products, plus 2 generous samples and a bonus product that covers hair, skin and make up. The winning product for me is the Monu Calming Cream as i really do enjoy using their products. Sign up for £10 per month plus P&P here. 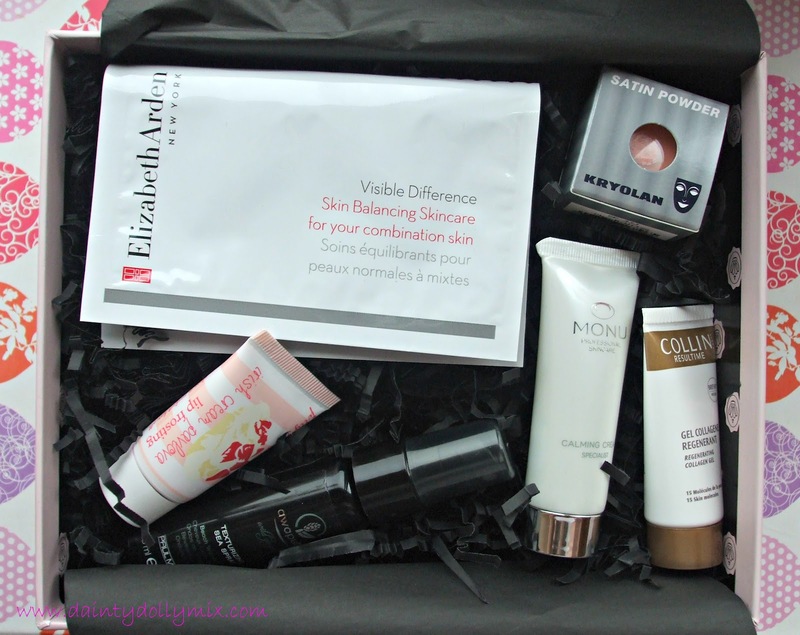 Did you receive this months glossybox? What are your thoughts on the products you received? Just subscribed to Glossy Box! Finally gave in!